Eun Ha Won (Park So Dam) is in the third grade of high school. She hopes to become a teacher which her late mother always wished for. Ha Won has a bright personality and a strong set of morals, but she is unhappy at home. She's unattached from her father, step-mother and step-sister and also mistreated. Ha Won works various part-time jobs to pay for her upcoming university tuition fees. She knows she needs to make more money to pay for the storage of her mother's ashes at the cemetery. Meanwhile, Kang Ji Woon (Jung Il Woo), Kang Hyun Min (Ahn Jae Hyeon) and Kang Seo Woo (Lee Jung Shin) are spoiled cousins and live together in the mansion Sky House. With their different personalities. After various accidents Eun Ha Won ends up working part-time at the sky-house. Sorry for the dull plot description, but I felt like if I said more or left something else out, it wouldn’t make much sense. One of the reason are the writers, (yes I blame them), because what’s up with writers forgetting the plot halfway through the drama. This was a preproduction drama, so it can’t be the ratings that changed the scripts. I won’t say what it Is, because that would spoil the drama, but I tell you it’s annoying. Now the actors, Jung Il Woo, you are soon-to-be 30-ish, why play a 20-year-old? Some actors can pull it off, you were sadly not one of them. On the other hand, he had great chemistry with Park So Dam (and she did a great job herself), so let’s call it even! The whole cast were great EXCEPT one. 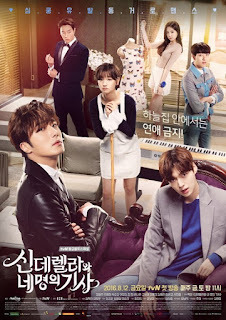 The whole 16 episode drama, I kept wondering why, oh god why, cast Son Na Eun. She was so bad she hit a whole new record on bad acting. Maybe that’s the award she’s after. All in all, it’s a good drama, to use as a hangover cure after watching a really good drama.